Yogyakarta, Thursday, August 9, 2018, Master of Science and Doctoral Program FEB UGM conducted the second welcoming day for the new students. 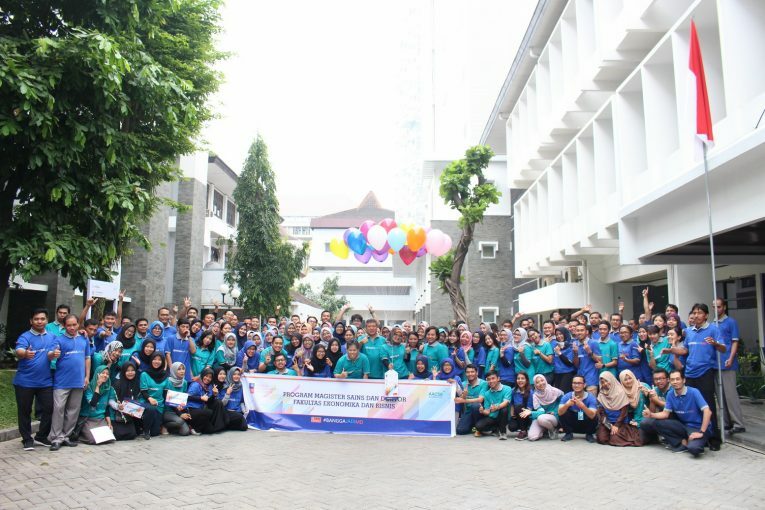 The second welcoming day was started by morning workout in front of the building of Master of Science and Doctoral Program FEB UGM. Furthermore, live music performances, sports, and some interesting games also were held. The balloons marked “REACH Program” was released into the sky to be the symbol of the ceremonial event. After the ceremonial event, the REACH program was continued by scholars day out program, an orientation program to introduce the campus environment in the new students. The new students were guided to explore the University facilities. Master of Science and Doctoral Program FEB UGM also added some supporting programs to build up the new students on this program. For example, the Philosophy of Approach and Application of Learning Research Methods provided by Prof. Jogiyanto Hartono., In this chance, Ph.D. Prof. Jogiyanto Hartono., Ph.D. explained 12 criticisms in education that can be responded by Student-Centered Learning (SCL). SCL emphasized improving the quality of thinking, increasing attitude of mind, improving personal quality, and increasing the ability to apply the knowledge. After Prof. Jogiyanto Hartono., Ph.D. had finished explaining about SCL, Prof. Catur Sugiyanto, Ph.D. pointed out some academic tools facilitated by Master of Science and Doctoral Program FEB UGM, such as 42 computer sets, 4 libraries, 11 lecture rooms, 4 study rooms, auditorium halls, faculty lounges, student association rooms, student lounges, stationery shops, photocopy station, prayer rooms, and Bank Mandiri. Besides, Master of Science and Doctoral Program FEB UGM also provides the academic tools software: data processing applications, UGM wi-fi, and e-mail services, SINTESIS, online library catalog access, online journal access, and online thesis and dissertation access. Prof. Catur Sugiyanto, Ph.D. said that all these academic tools can be used by all students to support the learning process in this program. Communication Skill also had been given by Rr. Tur Nastiti., Ph.D. In this session, Rr. Tur Nastiti., Ph.D. conveyed the importance of communication to support the REACH Program process. She also emphasized that communication skill is contained in the MSc mission. Lastly, Nurul Indarti, Sivilokonom, Cand. Merc., Ph.D. delivered about Writing Academic Documents and Anti-Plagiarism. Nurul Indarti, Sivilokonom, Cand. Merc., Ph.D. explained many common mistakes in the writing process. For example, the writers/authors cannot identify what the kind of their text which is appropriate with the audience. Moreover, they do not explain clearly their arguments, reflect the content, make the conclusion, use the right references, use good and correct language, and even their text is not readable. Besides, Nurul Indarti, Sivilokonom, Cand. Merc., Ph.D. also defined about plagiarism. Plagiarism is a form of academic fraud or crime that occurs when the writers/authors misrepresent the others work as their own. To response that cases, Nurul Indarti, Sivilokonom, Cand. Merc., Ph.D., gave some tips to avoid the plagiarism in the academic world.